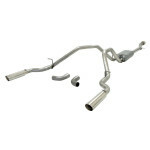 Flowmaster offers performance exhaust systems, mufflers, exhaust kits, racing mufflers, stainless steel mufflers, exhaust accessories and tips for cars, muscle cars, trucks, SUV’s, and most vehicles. One way they separate themselves from the competition is with their unique muffler design. Instead of using acoustical packing material, the inside of their mufflers are chambered to deliver a consistent, muscle car sound. 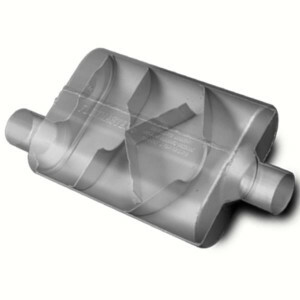 How Are Chambered Mufflers Different? 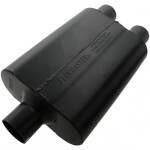 Flowmaster mufflers have a chamber-style design and use no acoustical packing material. Instead, they use metal plates, called baffles, to separate the sound waves. After the sound waves are redirected they collide and cancel each other out. 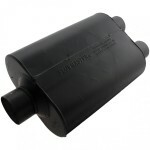 Unlike Magnaflow or Borla mufflers with acoustical packing material, these mufflers do not require a break-in period. The sound you hear on your first drive, is the sound you’ll get every time you start up your car or truck. 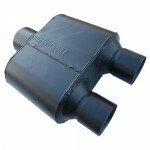 In contrast, mufflers with acoustical packing can take up to 400 miles to settle into their normal sound. 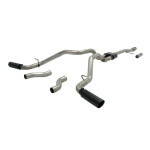 Is a Flowmaster Exhaust Right For You? Are you a proud owner of some old school muscle? Then a Flowmaster exhaust is something you’ll appreciate every time you fire her up. 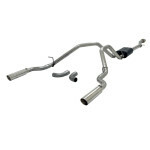 Flowmaster exhaust systems are designed for both trucks and domestic vehicles but they make sure to cater to most vehicles with both vehicle specific and universal kits. 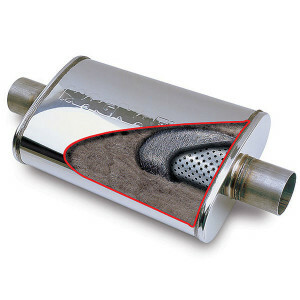 Flowmaster also offers a Lifetime limited warranty on all of their stainless steel exhaust systems and mufflers.